← Bannon Is Gone – Or Is He? Once upon a time, I was employed to run a department within a non-profit organization funded by grants. The other department heads along with the director often worked away from our office. Moreover, the director lived in a far away town. He only came into work two times a week and slept overnight in the building. He needed an Administrative Assistant to take over day-to-day operations, and quickly. I was on the hiring committee along with another department head. My job was to check out applicant references. When “Cynthia” was being considered, I reported to my boss, “They liked her, but they all said they didn’t work directly with her. That’s a red flag, you know.” He grunted and said nothing. Charmed by this tall elegant-looking woman, he and the other department head hired her. She became the bane of my life, not only my life but the lives of all of the other employees. Within a couple of weeks, Cynthia took the organization’s credit card and went to Europe for a month, claiming she couldn’t come back because she had picked up a disease that’s only found in tropical areas of the world. While I worked on ancient Windows computers with a screwdriver and pliers, Cynthia bought herself a deluxe toolbox that cost a thousand dollars and stashed it in her desk unused. Cynthia purchased new software intended for giant corporations for a hundred thousand dollars and paid consultants tens of thousands to install it. None of the staff ever used it – it was too complicated. Even the bookkeeper quit, unable to do her job. Cynthia promptly hired a new guy to replace her. While she charmed every male who visited the building, Cynthia look great pains to torment all those who worked for and with her. Employees even came to me in tears. I told him if he wanted to know the truth he could ask our receptionist, but obviously he never did. A short while later, Cynthia came up one of her best signature moves. The director put her in charge of getting a new phone system for the building. She came to me and sweetly asked me to meet her down at a Silicon Valley corporation that made office communications systems. I drove the forty miles to the company, was passed through security, and found myself in a room full of male executives in expensive suits and ties. Feeling quite under-dressed, I introduced myself. Cynthia rose like a tornado that had touched ground, and dashed out of the room. I did likewise, only to see the tail end of her rental car going out the gate and turning left towards the airport. Shortly after that, Cynthia got the director himself in hot water. On a day the director was gone, she hired a temp worker who was a licensed accountant to do bookkeeping. Cynthia hired the woman at an astronomical salary. But there was no need of a bookkeeper – she had already hired one. The director immediately laid off the temp worker. She, in turn, was instantly dropped by her temp agency for breaking the non-compete clause in their contract. The director paid out thousands of dollars to avoid the ensuing lawsuit and was removed from his position at the top of the organization by the Board of Directors. Not until Cynthia changed all the locks on the newly-hired director’s file cabinet—along with all of the doors to the building and left with the keys never to be seen again, was she finally fired. He then told me a year after Cynthia disappeared, they’d found they’d been paying for a storage unit she rented. In the storage locker they found only an empty battered suitcase and a few old clothes. So why read Snakes in Suits? Because it tells bosses how to avoid hiring a person like Cynthia, and it advises coworkers, bosses, and other potential victims how to cope with a psychopath at their workplace. 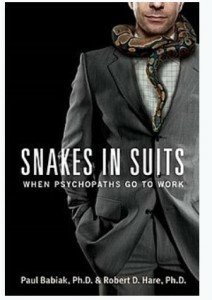 It explains the basics of how psychopaths operate and includes stories about them that clearly illustrate the damage they can do to those in large corporations—as well as smaller organizations like the one I worked for. For those hiring executives at the top, there’s now a psychological evaluation test that can help identify the difference between a “go-getter” and a psychopathic personality. For all of us there are valuable tips on interviewing applicants in a chapter devoted to how-to-hire employees. If you work with or for other people, this book might be the most useful thing you’ve read since What Color is Your Parachute?